There is a masterpiece of a movie waiting to be made from Daphne Du Maurier’s pointedly ambiguous 1951 Gothic novel My Cousin Rachel, but all it’s inspired so far are credible and faithful adaptations—first a Hollywood romance with Olivia De Havilland, then a BBC miniseries with Geraldine Chaplin, and now a mordant and fittingly morbid British film with a superbly cast Rachel Weisz in the title role of a 19th century widow who arrives at her late husband’s estate in the ruggedly scenic English county of Cornwall under a cloud of rumors and suspicions. As in all iterations, the narrative unfolds from the limited point-of-view of Philip Ashley (Sam Claflin), an orphan lovingly raised from childhood by his older cousin, Ambrose (Claflin again). After traveling to the warmer climes of Florence on the advice of his doctors, the lifelong bachelor Ambrose unexpectedly announces that he is marrying Rachel (Weisz), a half-Italian relation whom Philip has never met, but his letters home soon turn paranoid, hastily scrawled with dark accusations against his new bride and their Italian lawyer, Rinaldi (Pierfrancesco Favino). Traveling to Florence, Philip learns that his cousin has died of a brain tumor (which supposedly explains his paranoia); that Rachel has already left; and that Ambrose has willed him his entire estate, to be inherited on his 25th birthday. Making a welcome return to interesting movies after the likes of Hyde Park On Hudson and Le Week-End, writer-director Roger Michell adds a few small but suggestive twists to the story, including the double-casting of Claflin as both Philip and Ambrose and the implication that Ambrose may have been gay—something that only adds to the psychological complexity of Rachel’s character. Far from the femme fatale of Philip’s imagination, the widow turns out to be charming, relatable, and, worst of all, independent-minded and funny, which only fuels My Cousin Rachel’s danse macabre of suspicions, appearances, and morose mutual attractions. Like Michell’s flawed-but-memorable Ian McEwan adaptation Enduring Love, which cast Daniel Craig and Rhys Ifans as two complete strangers who witness the same bizarre fatal accident, this is in some ways a portrait of a toxic bond based on death: the woman who sees her husband’s double in his young heir (or so she says) and the short-tempered young man who alternates sympathizing with her and being seduced by the possibility that she might be a fortune-seeking murderer out to poison him. 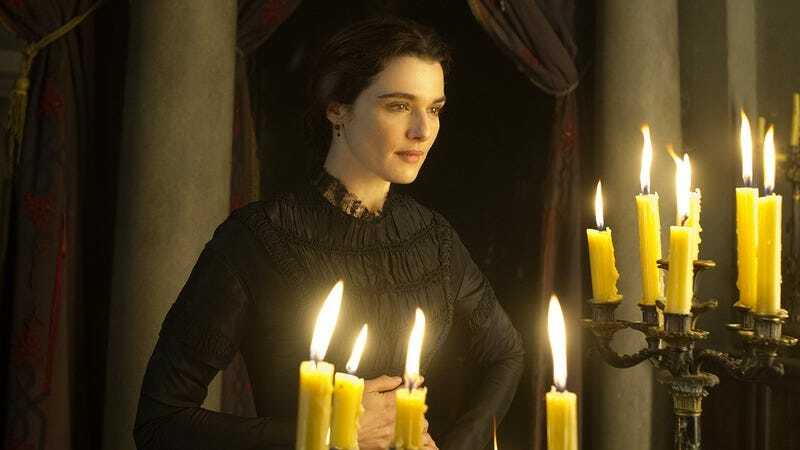 As in its source material, My Cousin Rachel’s plot ambiguities are as much a commentary on the tropes of Gothic suspense as they are a source of tension. But seeing as they’re restricted to Philip’s moody point-of-view, and to his limited understanding of both Rachel and the more age-appropriate young-lady-next-door Louise (Holliday Grainger), they can be repetitive well before the subtext has been exhausted. Michell’s style is handsomely professional and sometimes tasteful to a fault, but even when the movie loses its grasp on the sicker and more troubling undercurrents of its central relationship, it can coast by on those pleasures inherent to all Gothic narratives: rocky, windswept landscapes; candelabras carried up creaky staircases; musty rooms with water-damaged wallpaper; faces behind delicate veils of black lace. It might not be a visual buffet on the order of Guillermo Del Toro’s Crimson Peak, but sometimes a more modest meal will do.